Also, this is why you should never let me tell fairy tales to your kids. So back to the present and Regina and Emma are caught in magic mirror land which is all a bit weird and I rapidly begin to lose patience. Since they missed their previous portal they need a new way out. Emma finds Pinocchio; since his dad was the one who created the last portal cabinet. She talks to him, manages to convince him super super super easily that he lives in a mirror world and nothing is real (really, everyone in this episode is so quick to believe their world isn’t real). We have a brief interlude from an older Killian who has let himself go and, via a broken chisel, Pinocchio has a sudden crisis of faith and that means Emma has to feed him his own message – if you believe in yourself you can be a master capenter too! Also, no matter how damn powerful your belief is, if you think you can make a cabinet by hitting a tree with a chisel then you’re not going to become a master carpenter. And this is me saying this, the closest I get to carpentry is separating chopsticks. So we join Regina who is with fake!Robin and Regina is having a bit of an angst attack. Because everyone in this world seems to be deliriously happy without her and it looks like we’re lining up for a whole Regina’s pain storyline which can we please not, pleaaaaaaase not again. She catches up with Robin and gets all sad when she realises he’s all happy as well: everyone is happy without her. After which they’re both captured which allows more heart-to-heart in which Robin is, as I said before, bizarrely willing to accept that he’s in an alternate world. Of course he is. Lifeline Regina! One person’s life is better with you in it. Sure he’s dead. But he was happy before he died! They make their escape and join Emma with her dubiously created magical cabinet. And Emma suggests bringing Robin as well – because maybe some part of the original Robin may be part of him. Regina is wary – but she’s wary because it’s her; because she never catches a break, because she never gets her Happy Ever After. Because she always has the painful ending. Emma convinces her and they go through the cabinet - and make it back to Storybrooke. And for a moment I thought Robin didn’t come through and I was ready to curse out Once Upon a Time again… but he makes it! This… is not how heroism works. Belle in particular appeals to David (who has decided to protect Emma by doing all the work himself and leaving Mary Margaret to sleep. Which is really patronising because it assumes a sleep-deprived David is more capable than Mary Margaret. Don’t get me wrong, I’m not waving the flag for Mary’s competence, good gods I am not – but David is in the same boat here. At least he recognises how ridiculous his wish was) and Killian for peace: David wants Gideon dead because he’s a threat to Emma while Belle hopes there’s a peaceful resolve for this. Everyone meets up in the main square – where Gideon and Emma have their confrontation. 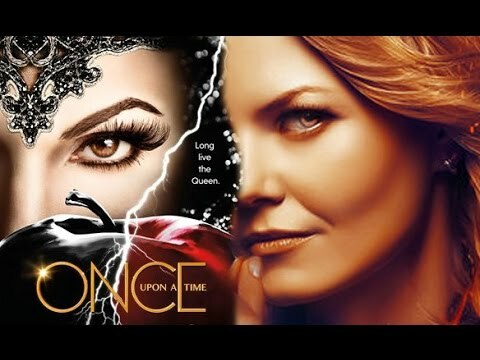 Everyone else is frozen by Gideon’s magic (Rumple and Regina have, like so many other times, completely forgotten they have magic) and it comes down to a sword fight between Gideon and Emma, just like her visions. Really, a whole season of ominous foreshadowing is over in a moment because Emma belatedly remembered a mangled Ugly Duckling story. I am disappointed Once Upon a Time you don’t build a story for this long and end it so casually. Booo. There’s a lot these two are going to have to unpack. And it looks like Rumple is stepping back on that Redemption Train again.